We first met Issie and Adam with their families mid last year to discuss Chuppah options for their upcoming wedding in March. They came to us for advice about their Jewish wedding as this is an area that we specialise in. From there, the advice grew into something much bigger. We started by discussing their vision and their “must haves”. 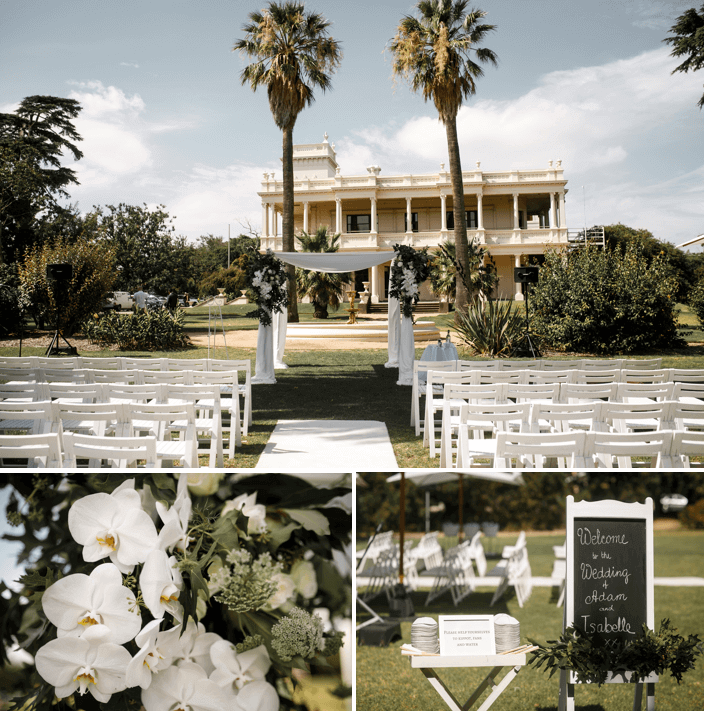 The couple valued the traditional elements of a wedding, together with the historic surroundings of the area, whilst also wanting to incorporate their own style with everything based around the white and green colour palette. The couple preferred simple and elegant rather than anything “flashy” as this did not suit their laid back personalities. Issie and Adam trusted us with their day and their vision and we couldn’t have asked for a better reaction from them than what was received. Issie and Adam, thank you again for sharing your beautiful day with us! Once we had finalised all the details for the ceremony, we could really focus on creating a reception space that was relaxing, romantic and full of greenery. The couple booked Peninsula by Atlantic Group. This venue was the perfect environment for our team to create Issie and Adam’s dream wedding as the venue provided a blank canvas to work with. With almost 40 tables, we decided the space required a lot of texture and different elements. We created four table designs that were simple in themselves yet slightly different versions of the next to get that “wow” reaction as guests’ eyes dotted around the room. Each design had a touch of greenery with pops of white floral – the biggest “must have” on the couples list. As they were pronounced husband and wife surrounded by the beautiful green gardens, we wanted to continue the story through to their reception space and bring the outside in. As the venue has high ceilings, tall designs were a big part of creating the wow factor that we were after. One tall design consisted of beautiful white florals and greenery to create a larger version of the bridal bouquet. We then surrounded the base with candles to ramp up the romantic feel. The second tall design was a mass of different types of foliage to act as a “mini tree” to incorporate the garden feel from the ceremony. White flowers were then placed around the base to add another textural element to the table. The low designs were brought in to compliment the tall designs. One of the low designs mimicked the larger version of a bouquet and sat flush on the table. The second low design was a story of vases, each with a different flower or type of foliage. This design was structured with clean lines in between the slightly unstructured nature of the other designs. Candlelight was the perfect addition to each table to add a romantic feel that was also high on the couple’s list of must haves. 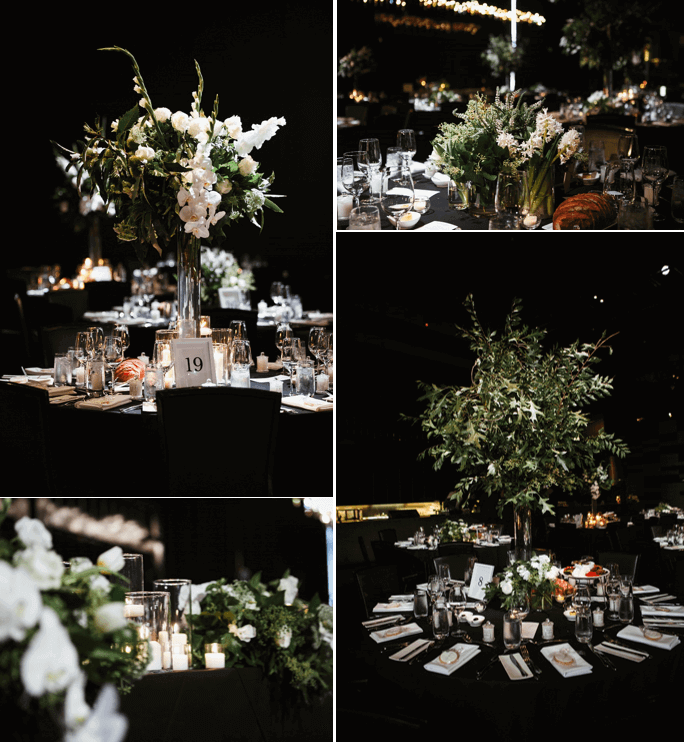 Sitting under the venue’s built-in feature chandelier, the bridal table was adorned by beautiful white orchids amongst a backdrop of greenery and other white flowers. This was combined with candlelight in various vessels of various sizes adding to the already romantic setting. With pops of florals and candlelight also surrounding the room in areas such as the gift table, bar and bathroom, the whole space was transformed in Issie and Adam’s vision.